Kelvinator washing machines have been around in most of the India households along with Kelvinator range of refrigerators. This Kelvinator washing machine is a semi-automatic model that comes with a wash load of 7.3KG. The make is designed in such a way that the body remains free of rusting and the wear and tear caused because of it. 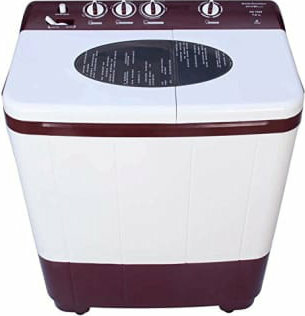 This 7.3KG Kelvinator washing machine price is currently marked at INR 10,900. However, this would not be the best choice of semi-automatic washing machines in this price bracket. Kelvinator washing machines have started operations in the semi-automatic washing machines segments for more than three decades. It has been a pioneer in coming with up solutions for getting your laundry done for a long time and it still continues to do so by offering a range of Kelvinator semi-automatic washing machines and Kelvinator fully automatic washing machines. The twin pulsators available in this washing machine ensures that you get that complete wash without any sorts of inconvenience. Kelvinator KS7315DM 7.3 Kg Fully Automatic Washing Machine full specs and reviews as of Apr 2019. Buy it here!